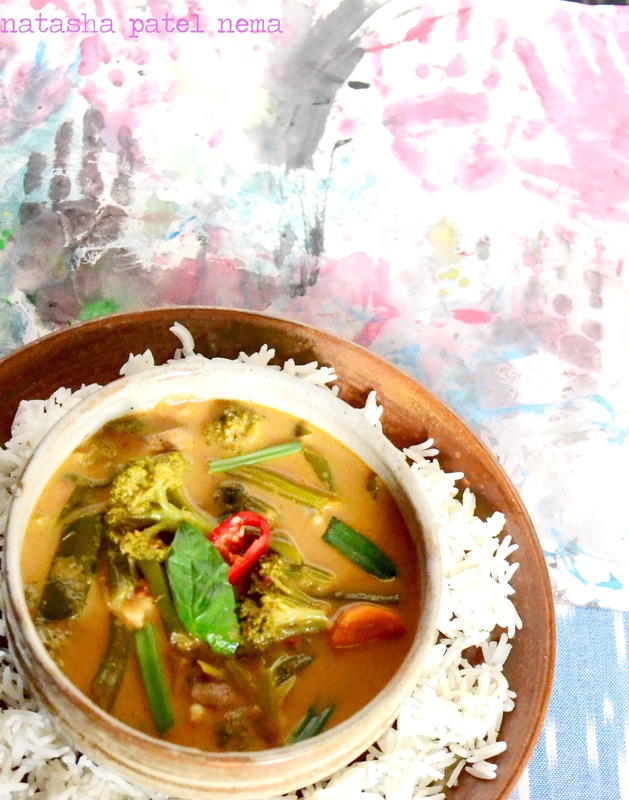 The vegetables, red chilies and the lemon grass were calling me. Son happily painting and making a mess and me happily cooking, not making so much of a mess. I always encourage my son to paint, so that he learns to express himself. Very essential for any person to able to live a a happy life. I don’t know how long will this painting phase go on but I wish it lasts. For me creativity, any form art is a reflection of one’s soul and I am glad my son enjoys it. I am really sorry for people who are unable to express their self as it reflects emptiness or supression which causes lack of communication. 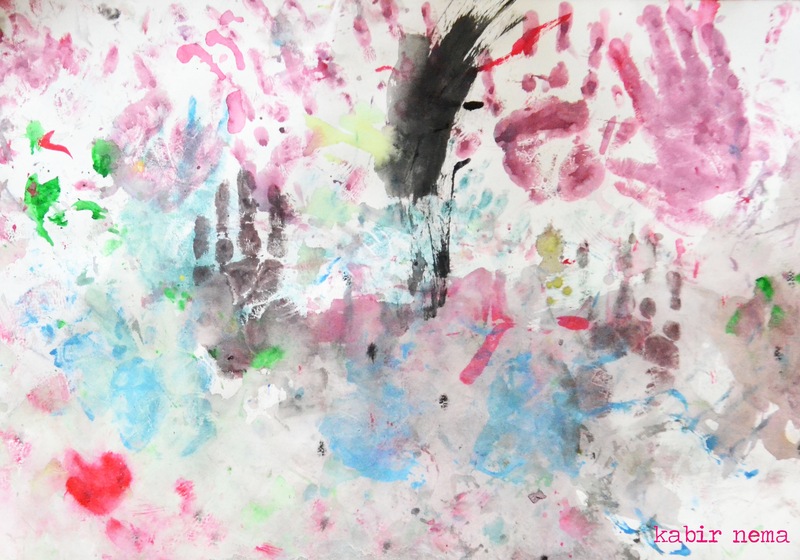 After painting, spilling water color on our dinning table which we call the mess corner he comes to me in the kitchen, “mumma finish”, he looked unrecognisable as if he had played holi and come, colors all over his hands, face, feet, everywhere. In fact he had black color on one of his eyes which looked like he had got a back eye, green on his ears like an elf . With red on his feet he came making a red trail in the kitchen. His feet trail made our house look like a set of some saas bahu serial (the bahus in those serials are welcomed with their feet put on red color kanku as if they are welcoming a goddess and later the poor bahu is shown her place like a maid lolz I guess that happens in real life as well in some houses, just kidding) or maybe our house looked like dragon and dungen house with the trail of red colored feet…huh ha ha..ha! So after giving him a bath , putting him to sleep, cleaning all the mess, I too decide to take a nap. One of the best naps I saw beautiful colors in my dream as well and scenes of the peotry I read every night. I was probably smiling in my sleep 😊 smiling seeing the visions in my dream or may be because I cooked a satisfying Thai curry and also managed to click a tempting photograph. Mix all the ingredients in a smooth paste in a mixer; the color should be reddish to coral. This will make about a jar full of paste. You can put in the freezer for later use. Add veggies first the carrots, then baby corn let them cook for 2 minutes then later french beans. Add mushroom, basil leaves, Soy sauce, palm sugar and salt to taste. Cook for about 2 to 3 minutes when all the veggies are cooked [they should be bit crunchy], add the green onions, take it off the heat and serve. 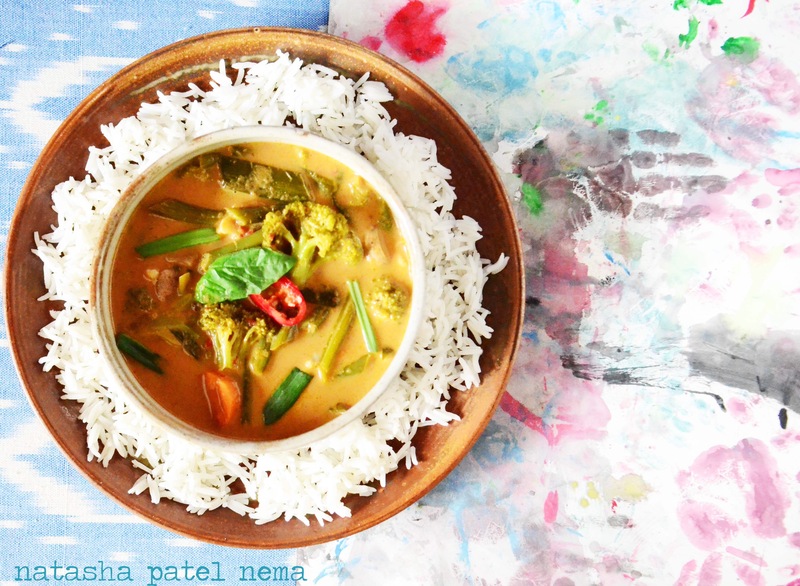 This curry should be eaten with Thai jasmine steamed rice.